Fall is in the air and winter is fast approaching. While the thoughts of some turn to cyclocross and the ski slopes, others are thinking fat. Not the Jan Ulrich “I ate too many Danishes this winter” fat, but fat tires. Really fat tires. The past few years have seen a ground swell in a new type of bike and opened up a new season for riding. Enter the Fat bike. Some brands that you have been familiar with such as Salsa and Surly have been cranking these bikes out for several years. A brand you may be less familiar with is 9:ZERO:7. 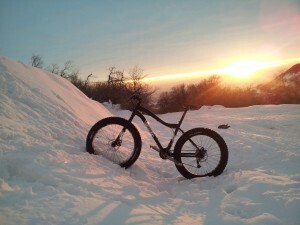 That may be because Fat bikes are all they make, and they are very good at it. I became aware of them when reports surfaced that this company that was born and bred in Alaska was setting up shop in Ogden, Utah. While this was true, 9:ZERO:7’s stint in Utah was short lived and over the summer they decided to return to their roots and consolidate their operations back to AK. As I have been intrigued with these bikes while they were here, I reached out to the company to learn more about the brand and its products. That contact resulted in an opportunity to demo their Tusken model in February 2013 and see what the hype was all about. I had a vision of floating over any sort of white terrain, much like snowshoeing. I was in for a rude awakening when I found that riding a fat bike in the snow actually required quite a lot of finesse and focus. You have to carefully pick your line much like riding a regular mountain bike in soft sand or loose trails. The really soft stuff was very challenging to push through. The frame was ridged and transferred power to the pedals very well. This allowed it to climb adeptly, although it was necessary to stay seated most of the time to maintain traction. Descending felt rock-solid and a little surreal to be riding down snow covered trails on a bicycle at 30+ miles per hour. The handling was very nice and made picking and maintaining a line a piece of cake. Fat bikes require very low tire pressure (around 5 pounds) to allow the tire to flatten out for better grip and shock absorption. The effect is such that front or rear suspension is not necessary for a smooth ride. I found the most enjoyable terrain to ride were trails that had been packed down by hikers, snowmobiles or ATV’s. The disk brakes provided plenty of stopping power and are minimally affected by the wet conditions. I was amazed by 9:Zero:7’s ability to put together such a light bike that can support such large wheels. The shifting provided by the SRAM drive train was flawless and component selection was well thought out. Clipping in and out of clipless pedals proved to be a challenge when cleats become snow packed. The folks at 9:ZERO:7 told me that some riders choose to use a cleat-less system like Powergrips toe straps to avoid snow clogged cleats, and to accommodate boots for extreme weather conditions. A natural outgrowth of 9:ZERO:7 was the recognized need for a good source of fat bike parts such as custom wheel sets, tires and components. 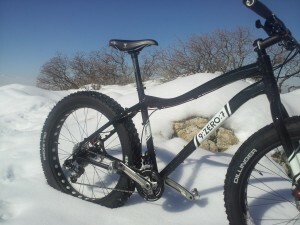 The company has established www.Fatbikes.com to pro vide these items and is a major component of their growth and success. Innovation continues and 9:ZERO:7 is currently taking preorders for a new carbon “Whiteout” frame with several other new products in development. As of this writing the demand is so great that it exceeds the availability of product as this is the busiest season of their year. Large 170mm spaced 9:ZERO:7 with 135 mm spaced fork. X9 build kit with Race Face Turbine cranks. 45 degree North Dillinger tires on Surly Rolling Darryl WTB Rocket V saddle. Trivia tic stem , bar, seat post Avid BB7 brakes. Retail price for the frame: $799.